Happy November, loves! If you have been following along with the We Are Booked Photo Challenge on Instagram, you may know Tracie and I just wrapped up the second installment of the challenge. Thanks to you guys, these book challenges have been so much fun! We have met so many new book buddies and found so many great books along the way. And what better way to celebrate that success than keeping the good times rolling, right? 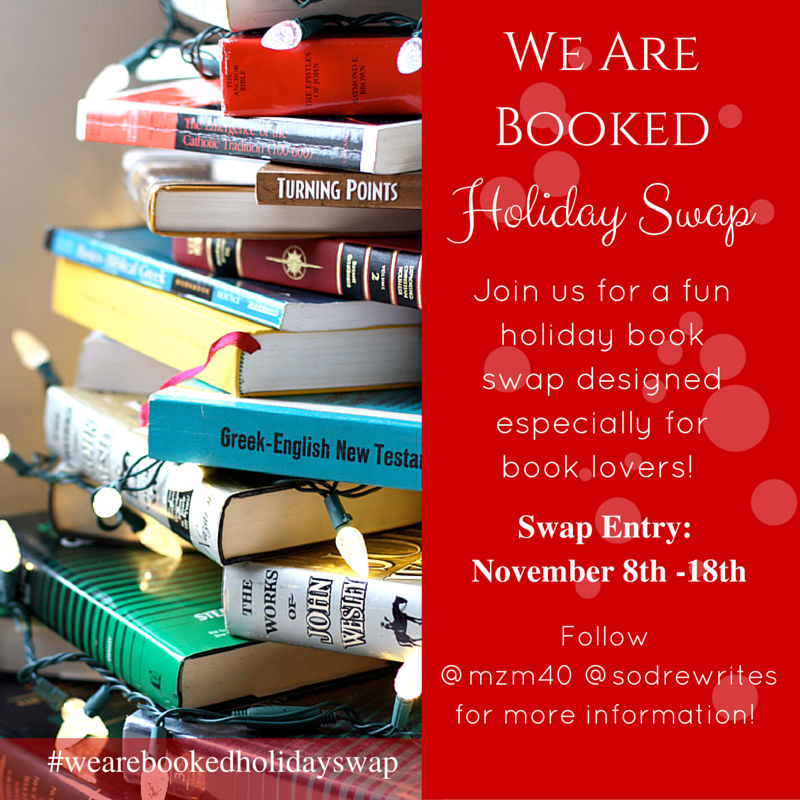 So for the holiday season, we will be hosting the first ever We Are Booked Holiday Swap! So how does the We Are Booked Holiday Swap work? On November 8, Tracie and I will both be posting a sign-up form on our blogs for all that are interested in participating in the holiday swap. Once everyone is signed up, each participant will receive information about another participant, anonymously. No one will know who has his or her name until the day he or she receives the package---just like the Secret Santa gift exchange. Sounds like fun, right? The form will be only be active from the 8th until the 18th, so make sure you sign up and tell your friends to do so as soon as possible. This way, everyone's packages can be mailed out by December 1st. This swap is open to all of our readers! One does not have to be on Instagram to participate. If you have been following along with the challenges and know someone who loves to read and receive bookish mail just as much as we do-- feel free to share this message with them! Tag them in this post if they are on IG and tag them here if they are on Facebook--the more the merrier! Exactly what is included in each "swap?" The idea of the swap is to give the gift of happy reading for the holidays. As we learned from the book photo challenge, there is a large community of fellow book lovers. Participating in this swap is an awesome way to share the love of reading with another. In the swap, each person will receive information about another participant's taste in books (ie, favorite genres, books, etc). They will also receive a list with a few books on that participant's wish list. You will use that information to purchase a book for them and/or a few other bookish items (bookmarks, or stocking stuffers) if you should choose to do so. But please keep in mind: bookish mail + gifts are not to exceed $25. Tracie and I really hope you will join in on the fun! If you have any questions, please feel free to email or contact us on any of our social media accounts.